Welcome to this year's 48th issue of DistroWatch Weekly! With the many high-profile efforts to bring Linux to desktop computers, it's easy to forget that Linux has been dominating other certain areas of computing, such as servers, for many years. Yet, server-oriented Linux distributions are relatively rare. 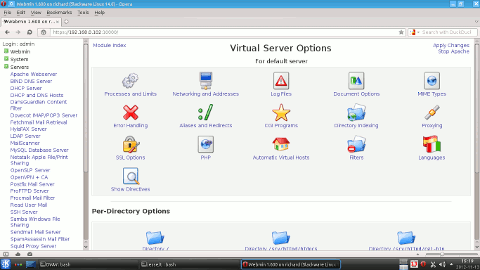 The Slackware-based Superb Mini Server is one notable exception, focusing exclusively on server deployments and configuration through the intuitive Webmin web-based interface that can be accessed from any web browser. So how does the recently updated release of this small project stack up against the big Linux guns that dominate the server rooms? Read below to find out. In the news section, impatient Fedora users await the much-delayed beta release of version 18; Debian announces the availability of the fourth beta of Debian installer for "Wheezy", and Illumos steps in to unite former OpenSolaris developers to work on a forked code base. Also in this issue, an update on Secure Boot that seems to be universally present on most new computers, and the usual regular sections, including an addition of NAS4Free to the DistroWatch distribution database. Happy reading! The Superb Mini Server (SMS) project is designed with the ideas of simplicity and power in mind. The project aims to give home users and small businesses all the server capabilities they need in one small, free-of-cost package. The current version of SMS is based on Slackware 14.0. According to the project's About page, the SMS server distribution is designed to be installed on a box that is connected to an ethernet port and then left alone. Administration of SMS can be performed via secure shell connections or through a web-based portal. By default, SMS does not include a graphical desktop interface, however it is possible to download and add a separate KDE module to the live SMS media. The default ISO for SMS is just under 500MB in size, making it a fairly lean distribution. I downloaded the media and gave it a test run. Booting from the live media allows us to run SMS in live mode, run it in live mode without any services enabled, run the operating system entirely in RAM, run a PXE boot server or start something called Cluster Mode. Interestingly, the default option is to skip all of these and simply boot from the local hard disk. Booting into live mode brings us to a command prompt login with a long list of provided services, the directory or network locations of these services and login information. Logging in as the root user brought up a message saying we have e-mail waiting to be read, however running the "mail" command indicates no messages are waiting to be read. Once I had confirmed SMS was on-line and the distribution was playing well with my hardware, I decided to perform an installation. SMS comes with a text installer on its live media and the installer's appearance reminds me a lot of Slackware's installer, though the process of installing is much shorter on SMS. First, the installer launches the cfdisk partition manager and we are expected to make at least two partitions, one for the root file system and one partition is recommended for swap space. Once partitioning is complete we are asked to confirm which partition to use for swap space and then we're asked to type in the full device name of the root partition, for example: "/dev/sda1". Up next, we are asked to select a file system for the root partition and we can select from ext2/3/4, Reiser and JFS. From there the distribution's files are copied to our hard drive, a process which just took a minute or two on my machine. Then we are told LILO is being installed and we can opt to provide any specific parameters needed to bring the system on-line. Then we reboot the machine and begin enjoying SMS. Well, we almost get to enjoy SMS. When I first tried to boot from the local copy of the distribution I found that it hadn't actually installed LILO. I went through the installation a second time and, again, found LILO hadn't been set up on my hard drive. Finally I used the SMS media to boot into live mode and manually mount the disk and run through LILO's configuration. Oddly enough, LILO returned an error saying it couldn't complete its install, but upon rebooting the machine LILO ran properly. 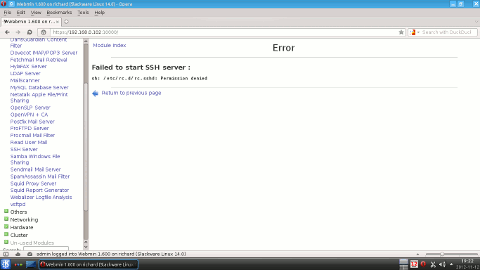 It goes to show you can't always trust an error message. Booting into SMS brings us to a command line login prompt. The distribution comes with the usual GNU/Linux command line programs and, by default, uses just 45MB of RAM. Most of the configuration and management of SMS takes place through a web interface, but in a pinch we can operate from the console. In addition to its Slackware base, SMS comes with the slapt-get package manager which ties into the SMS repositories. Looking at the list of potential repositories in the slapt-get configuration we also find Slackware 13.1 repositories are available, but commented out. I was glad to see slapt-get installed for us as it makes it easy to keep the system up to date with security patches and expand on the distribution's functionality. Though having the additional software sources as older Slackware repositories seemed outdated and it made me wonder why the SMS developers hadn't updated the sources to point to Slackware 14.0, SMS's base. 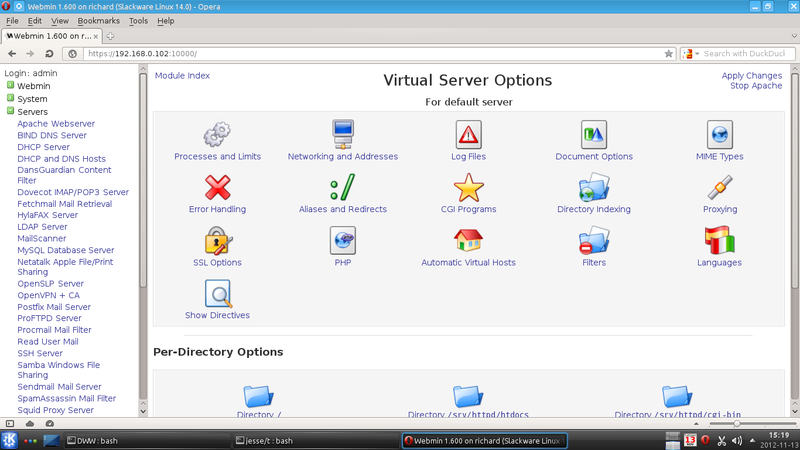 As just mentioned, most of our system administration will probably occur via the web portal, Webmin. This control panel is running on network port 10,000 and must be accessed using HTTPS in order to protect our login credentials. When we first login to the Webmin portal we are greeted with system statistics such as disk usage, CPU usage, memory consumption and uptime. At the bottom of the status display I found a message saying, "Warning -- Your system is actually running Slackware Linux version 14.0". I am not sure why this is something which requires a warning, but it's nice to know what our base is. The web portal has a list of admin activities and modules down the left side of the screen. These are nicely divided up for us so it's fairly easy to find, for example, a network service module or a module for managing users. The centre and right sections of the display are taken up with the details of the module we have selected. The interface is fairly plain, it's not exciting to look at, but I rather like it for all its simplicity. There aren't any distractions and I enjoy the plain approach. One of the first tasks I tried to perform was starting the OpenSSH secure shell server. Upon clicking the button to enable the service I received an error message saying I didn't have permission to enable the service, though I was logged in under the administrator account. The Apache module likewise refused to start. 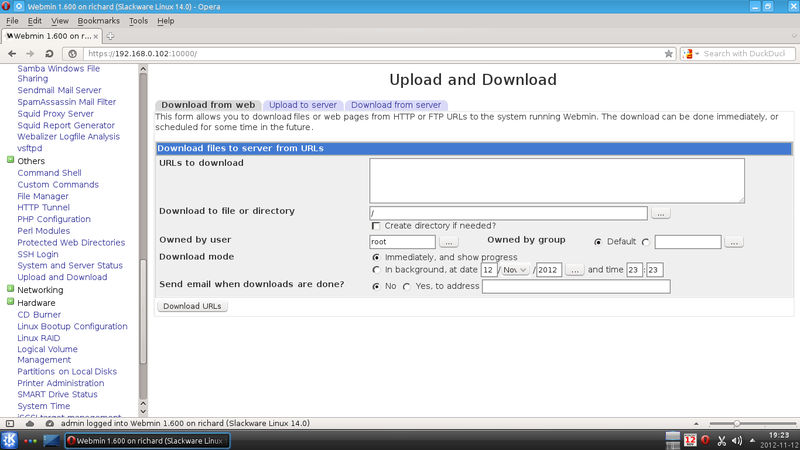 However, the Samba service did start for me, as did one of the available FTP servers. One module allowed me to pass console commands directly to an underlying shell and this worked, though the file manager module claimed I was missing a plugin and it refused to function. (A check later showed the missing plugin was Java.) Included in the admin panel is a module for managing packages and I found I could remove installed packages, but searches in the repositories failed to turn up any results, even for software which had previously been installed. Perhaps the oddest thing about using the Webmin interface was that some modules worked for me at one point, but following a reboot they wouldn't (or vice versa). For instance, the first time I tried launching the Apache web service it failed to start, but after a reboot I had no trouble launching the module. Up to this point one could be forgiven for thinking that my experience with SMS was a buggy mess. And, yes, at times it was. However, perhaps the strangest part of using this distribution was that features which didn't work one day would function the next. Or, rather, parts of them would work. 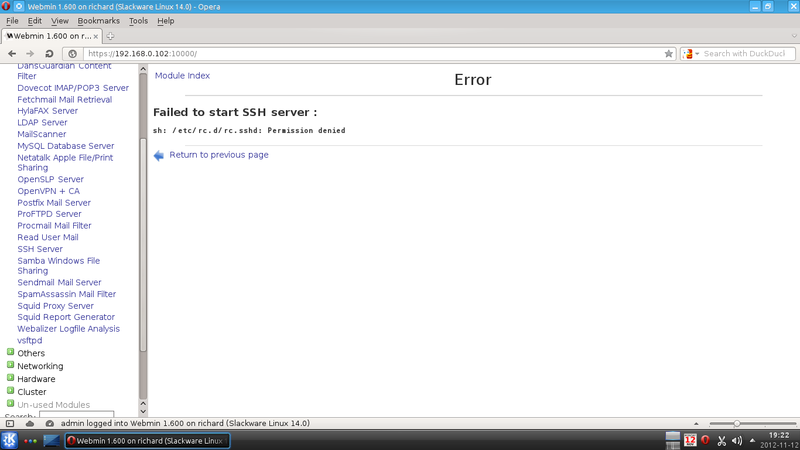 The second day of my trial I went into the modules section and successfully started the Apache web server. The warning message on the status page informing me I was using Slackware disappeared. Some modules, like the OpenSSH server still refused to start, but others launched without complaint. This was perhaps my biggest concern while using SMS, there didn't appear to be any consistency as to what would work and what would not and when. For instance, once I got the LAMP service up and running, I browsed to the default web page, selected the torrent client link, hoping to download SMS using SMS, and I was promptly told PHP wasn't working properly. However, when I selected other admin functions which used PHP, such as the phpLDAPAdmin tool, it worked flawlessly, making me think PHP wasn't the real issue. Going through the modules there was a strange quilt work of things which would or would not work (anti-virus didn't, disk checks didn't, the file manager didn't, Samba shares did and ProFTPD did). Now, I am willing to take some responsibility for the problems encountered. When I was reading the project's Download and FAQ pages, it sounded as though the only way to install SMS alongside another distribution would be to use the Live CD. The Native edition of SMS comes with a warning saying, "It will format your HDD and write the MBR. Don't use it for double booting". Naturally, I downloaded the Live edition, which can be installed beside other operating systems. However, when I was reading through the project's Wiki a few days later, I found there were repeated warnings against installing the Live edition. Maybe I should have given SMS a dedicated box to work with and installed the Native edition instead of playing with the Live CD. Perhaps installing from the Live edition was why services appeared to function or not at random, perhaps that's why LILO didn't install properly and perhaps that is why services I had enabled during one session were not started after a reboot. I'm willing to take my fair share of the blame, I probably should have read through the Wiki prior to installing the distribution. However, the Live edition appears to be the only option for dual-booting machines and, as such, I would assume it is commonly downloaded for the purposes of testing. As a demo, SMS didn't hold up well, or at least not consistently. The Webmin interface is great, easy to navigate and carries a great deal of functionality. The documentation in the project's Wiki is good and the light & clean Slackware base is well suited for this sort of project. On the other hand a lot of features didn't work, settings were not saved across reboots and I ran into a lot of errors. At this point I am of two opinions of Superb Mini Server. If the bugs I've encountered are indeed a result of installing the Live version instead of performing an exclusive Native install, then I would say SMS is fairly good. The light Slackware base with slapt-get for package management and Webmin for a graphical interface are a great combination. It's easy to use (once installed) and carries a huge range of functionality which should cover all of a person's home and small office server needs. On the other hand, if the bugs I encountered while using the Live edition are also present in the Native edition, then SMS needs polish before it can be considered functional and user friendly. Of all the Fedora releases to date the upcoming version 18 has already broken all the records in terms of delays in planning and delivery of milestones. This is not meant as a criticism though; in fact, it's always nice to see a distribution going to great extents to resolve all show-stopper bugs before presenting the result to the public. Still, some users find even the current pre-beta builds "very solid". 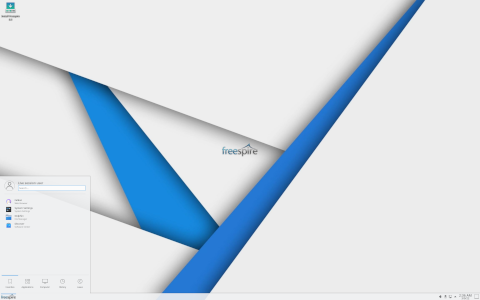 Scott Dowdle from MontanaLinux sums up his experiences in this report: "I've been remixing Fedora 18 pre-release for quite a while now. As you may recall the Fedora project has delayed the release of Fedora 18 beta several times now - mainly due to blocker bugs in their new installer and Fedora Updater (fedup). I think the rest of the distribution has benefited from the delays because I've been running it a while and it has been very solid for me. ... Over all, Fedora 18, even in this pre-beta stage, is working great and I enjoy the refreshed versions of GNOME 3 Shell, KDE 4, Xfce, LXDE, MATE, and Cinnamon. Should you give the pre-release version a try? If you are adventurous like me and are sure to take the precautions I did, go for it." Slowly but surely, Debian GNU/Linux 7.0, code name "Wheezy", is edging towards a stable state. Last week Cyril Brulebois announced the availability of the fourth beta of the Debian installer for "Wheezy": "The Debian Installer team is pleased to announce the fourth beta release of the installer for Debian 7.0 'Wheezy'. Highlights: many updates to the Linux kernel; many improvements in the netcfg component. Improvements in this release of the installer: console-setup - fix support for Greek and Ethiopian layouts; elilo - fix installation on ia64; GRUB 2 - fix some EFI boot failures. Linux kernel: block - fix infinite loop which caused ISO scan to hang; iwlwifi - do not request unreleased firmware for IWL6000; libata - prevent interface errors with Seagate FreeAgent GoFlex; random - improve random number generation on non-interactive systems; speakup - lower default software speech rate; speakup - fix crash on goto operation...." Users installing the distribution should also pay attention to the one known issue: "Network issues when installing a desktop over a wireless connection. A bug fix is expected for the next installer release." The OpenSolaris developer and user community, previously united under Sun Microsystem's umbrella, has found itself in the state of flux ever since Oracle's takeover of Sun and its subsequent decision to close the popular open-source project. Although several efforts have been made to re-unite the developers using new names and structures, the results have left many fans frustrated. So what exactly is the situation now, 3.5 years after the high-profile acquisition? Jack M. Germain explains in "Whither OpenSolaris? Illumos Takes Up the Mantle": "For the installed user base of the former Sun Microsystems' OpenSolaris operating system, questions about its continued support and development remain largely unanswered. When Oracle bought Sun Microsystems, it raised fees for its technical help and halted further development on OpenSolaris, replacing it with its own Oracle Solaris 11. Enter the Illumos Foundation, which created a fork of the OS and is gearing up to continue its development. Illumos developers see strong interest in the project as it gains momentum. An unexpected outcome of the Illumos project could be the birth of a modified business model for open source. The Foundation is focusing on a collaboration of developers pursuing their own interests related to the Illumos OS platform." A few weeks ago one of my computers, a desktop machine, called it quits after many productive years of service. Following a respectful period of mourning, I decided to go out and get myself a new desktop computer. Nothing fancy, just a nice low-end box. I settled on HP's Pavilion P6-2310. The machine arrived in a timely manner, I hooked it up and realized that in my haste to get my shopping over with I had forgotten one important detail: Secure Boot. Secure Boot, in case you missed all the excitement earlier, is a technology which is supposed to protect computer users from malware by insuring only trusted software can boot on the machine. How this works is, essentially, the computer comes with a security key (or keys) and any operating system or boot loader which we want to run on the machine needs to have a corresponding key. The idea is malware won't be able to sneak onto the computer and get loaded into memory before the operating system. A side effect, which many do not believe to be a coincidence, is operating systems other than Windows 8 are prevented from booting too. For some reason these details had slipped my mind when I was shopping on-line. When I hooked up the new computer and booted for the first time I was suddenly reminded in an unpleasant way. The first symptom was that I could not boot from any device except the hard disk. I was thrown into the Windows 8 set up process. The manuals which came with the computer do not mention, in any fashion, accessing the BIOS/UEFI, changing boot order or disabling Secure Boot. Typically in the past computers have displayed hints, such as "Press F1 to edit settings" or "Press F9 to change boot device" when they power up. Not in this case, no hints are given and we're left to trial and error. F10, I found, would grant me access to the machine's start-up configuration, but getting my thumb drive to boot took a few steps beyond that. First I tried to simply change the boot order and was told this was not possible while Secure Boot was enabled. Hunting through the menus I finally found the Secure Boot feature and, selecting it, I was informed (via a big, red warning box) that disabling Secure Boot was dangerous and not recommended. Then I had to disable Secure Boot and re-enabled "Legacy" boot options in the proper order and then, finally, I was able to enable specific devices from which I wanted to boot. After that I was able to boot from my thumb drive only if I knew to hold down F9 while the computer was starting up, we're not given that information. To the more technically minded, this might not seem so bad, but keep in mind these steps are performed without documentation, with no hints and with big warning pop-ups letting the user know what a bad idea disabling Secure Boot is. This is not something the average user is going to know how to do, nor will they likely want to follow through if they read the on-screen messages. This is a problem as much of the growth in the Linux community over the past decade has come from the ease of installing mainstream distributions. Distributions like Fedora and Ubuntu have made setting up a fresh install as simple as "Insert CD -> Click Next -> Next -> Next -> Enter a username and password->Next". Computers with Secure Boot remove that ease of use factor by throwing up hidden options, scary warnings and multiple menu items which must be accessed in a specific order before the user can even get to the "Insert CD" part of the installation process. Certainly, system administrators and more experienced users can work around these barriers, but there is a large portion of the public which is relatively inexperienced and willing to try Linux if it is easy to set up. Secure Boot means Linux is no longer simple to install, or even try, from detachable media. Now, you might be thinking, as I was, that it was foolish of me to purchase a machine with Secure Boot in the first place. After all, I've been warning people about it for long enough I should have been more careful. That was what was going through my mind as I went through the long process of getting my thumb drive to be recognized as a boot device. But then, the next day, I went back to the merchant's website and discovered something. There is no mention of Secure Boot, UEFI or Windows 8 certification anywhere on the page. How is a consumer to know, even if they are aware of the feature, whether a machine is locked down or not? Software freedom requires vigilance and I fear that is more true now than it was a year ago. Be careful when shopping for new computers, it is easy to purchase more trouble than one bargained for. Artyom Zorin has announced the release of Zorin OS 6.1 "Educational" edition, an Ubuntu-based distribution for schools: "The Zorin OS team has released Zorin OS 6.1 Educational, the education-oriented version of our operating system designed for Windows users making the switch to Linux. Zorin OS 6.1 Educational builds on top of our popular previous release of Zorin OS 6 Educational with newly updated software and a newer kernel. As Zorin OS 6.1 is based on Ubuntu 12.04 it is an LTS (Long-Term Support) release, provided with 5 years of security updates. Users who already have Zorin OS 6 Educational installed do not need to get Zorin OS 6.1 Educational as all the aforementioned updates and improvements in 6.1 can be applied by installing the latest updates from the Update Manager. We hope that you enjoy using Zorin OS!" Here is the release announcement. Stephen Harpster has announced the release of Vyatta 6.5, an updated version of the project's specialist distribution for firewalls and routers: "I'm pleased to announce that Vyatta Core (VC) release 6.5 is now available for download. Release 6.5 of the Vyatta Network OS adds significant enhancements including: support for Microsoft Hyper-V; Policy-Based Routing (PBR) which allows incoming packets to be forwarded based on policies, rather than just on the destination address; Virtual Tunnel Interface (VTI) which is a way to represent policy-based IPsec tunnels as virtual interfaces; BGP Multipath enables the installation of multiple BGP paths to a destination into the IP routing table; IPsec support for IPv6 using Internet key management protocol IKEv1; the VRRP (Virtual Router Redundancy Protocol) operational mode commands have been modified to improve usability...." Read the rest of the release announcement for further details. Clement Lefebvre has announced the final release of Linux Mint 14, code name "Nadia", in MATE (version 1.4) or Cinnamon (version 1.6) editions: "The team is proud to announce the release of Linux Mint 14 'Nadia'. For the first time since Linux Mint 11, the development team was able to capitalize on upstream technology which works and fits its goals. After 6 months of incremental development, Linux Mint 14 features an impressive list of improvements, increased stability and a refined desktop experience. We're very proud of MATE, Cinnamon, MDM and all the components used in this release, and we're very excited to show you how they all fit together in Linux Mint 14." For more information please visit the following pages: release announcement, what's new and release notes. Redo Backup & Recovery 1.0.4 has been released. Redo is an Ubuntu-based live CD featuring backup, restore, and disaster recovery software, with an easy-to-use graphical program for running bare-metal backup and recovery of hard disk partitions. What's new in this release? "Base upgrade to Ubuntu 12.04 LTS; percent complete now based on part sizes rather than total number of parts; Windows now have title bars to ease minimizing, maximizing and closing; time is now synced to localtime (hardware clock) after boot; widget theme changed to Bluebird for GTK+ 3 compatibility; now has a helpful beep to indicate when long processes are finished; added alsamixergui to enable mixer button on volume control; drive reset utility can now operate on multiple drives simultaneously; removed Synaptic and boot-repair packages to reduce image size." See the project's download page on SourceForge for a full changelog. Michael Tremer has announced the release of IPFire 2.11 Core 64, a specialist firewall distribution, with updated intrusion detection software and fixed MAC rules: "Today, we are releasing the 64th Core Update for IPFire 2.11. The Intrusion Detection program Snort has been updated to version 2.9.3.1, the corresponding daq library to version 1.1.1. This enables Snort to work with the latest VRT rule set. Outgoing firewall - the broken MAC rules have been fixed. It was impossible to use the MAC rules to allow hosts to access the Internet. A bigger rewrite of the code fixes this problem and makes the outgoing firewall a bit more performing. Minor bugs and feature enhancements: update accelerator - the path to the delete icon has been fixed; pakfire can now use the XZ compression." See the release announcement for more details and a note on the upcoming IPFire 2.13. Tim Booth has announced the release of Bio-Linux 7.0.3, an Ubuntu-based Linux distribution with specialist software for use in the field of bioinformatics: "Bio-Linux 7 is a full-featured, powerful, configurable and easy-to-maintain bioinformatics workstation. 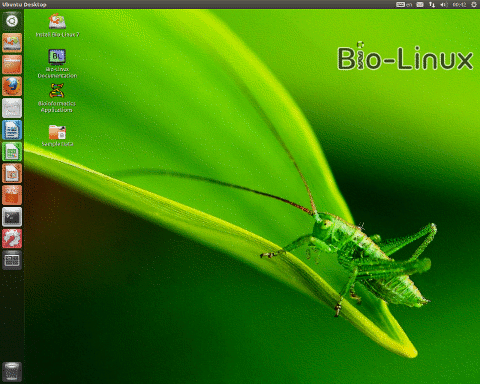 Bio-Linux provides more than 500 bioinformatics programs on an Ubuntu Linux 12.04 LTS base. There is a graphical menu for bioinformatics programs, as well as easy access to the Bio-Linux bioinformatics documentation system and sample data useful for testing programs. 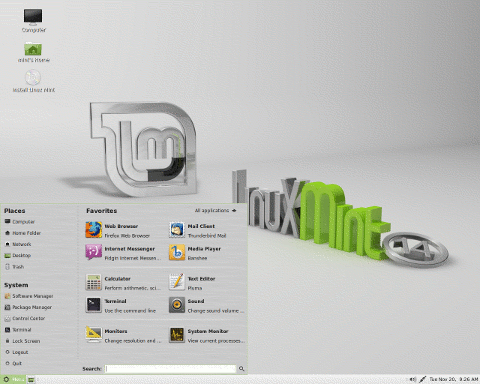 Bio-Linux 7 adds many improvements over previous versions, including the Galaxy analysis environment. There are also various packages to handle new generation sequence data types. You can install Bio-Linux on your machine, either as the only operating system, or as part of a dual-boot setup which allows you to use your current system and Bio-Linux on the same hardware." Visit the project's home page to read the release announcement. Alex Filgueira has announced the release of an updated version of Cinnarch, an Arch-based Linux distribution with Mint's Cinnamon as the default desktop interface: "Here it is, a new release of Cinnarch. This is a list of changes: multilingual access from boot menu in syslinux, and redesign (based on Manjaro's work); available languages: English, Spanish, Galician and German; multilingual welcome message; unmuted ALSA channels; fixed screenshot button; support for USB modems and VPN in NetworkManager; Nemo as Cinnarch's new default file manager (chosen by the community); default folders (Downloads, Desktop, Images); support for VIA graphic cards; installed missing dosfstools on Cinnarch Live; option to install GRUB 2 or any UEFI bootloader; LightDM replaces LightDM-Ubuntu; Pantheon greeter replaces Unity greeter...." Read the rest of the release announcement for a full changelog a brief list of major components. Stephen Ewen has announced the release of UberStudent 2.0.4, an Ubuntu-based live distribution with software for learning and teaching academic success at the higher education and advanced secondary levels: "After many months of hard work, I'm pleased to announce the immediate availability of UberStudent 2.0.4. 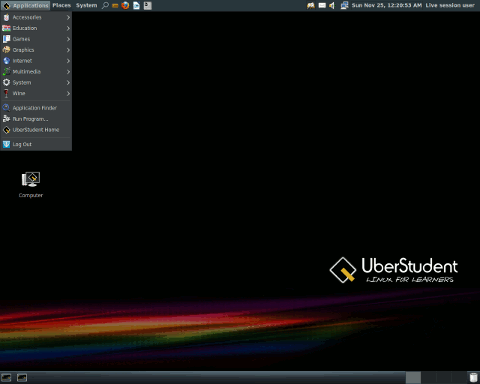 As many are already aware, Linux desktop environments have undergone a period of significant change since UberStudent 1.0 was released. GNOME took a hard turn towards the tablet market, injecting much discontent among users, a few forks, and a few new projects, only one which is mature, Unity, which has both its fans and haters (I myself dislike it). UberStudent 2.0.4 retains a traditional desktop environment by choice. Both Xfce and MATE are boot options, with Xfce being the default. I won't bore you with further descriptions. You can take the tour. And you might do well to read the release notes." Read the rest of the release announcement for more information. Jerry Bezencon has announced the release of an updated build of Linux Lite 1.0.2, an Ubuntu-based, beginner-friendly Linux distribution with Xfce as the preferred desktop environment: "Proud to announce the release of Linux Lite 1.0.2. With a number of enhancements, changes and additions Linux Lite 1.0.2 is smaller, leaner and has capitalized on the fantastic feedback it has received from the global computing community to produce a step up from the previous version. Changelog: all system software updated; Firefox 17.0; Linux kernel 3.2 PAE; reduced size of ISO image by maximizing compression of file system; added LibreOffice Impress; added ability to 'dd' the ISO image file; added tool tips for applications; added support for VMware; added libopenal1 for extra sound support; added keyboard shortcuts; PrintScreen key opens the screenshot tool; fixed bug where laptops unplugged from mains power source lost use of USB mouse...." See the full release announcement for a full changelog and system requirements. NAS4Free. NAS4Free is an embedded open-source NAS (Network-Attached Storage) distribution based on FreeBSD. NAS4Free supports sharing across multiple operating systems, including Windows, Apple and UNIX-like systems. NAS4Free is easy to set up in most home and enterprise environments and will allow to manage and share large amounts of data easily across a network. NAS4Free also incorporates many different streaming features for sharing multimedia with other devices on the network. NAS4Free includes ZFS v28 (RAIDZ, RAIDZ2 and RAIDZ3) Software RAID (0,1,5), Disk Encryption, S.M.A.R.T / Email Reports, and it supports the following protocols: CIFS (samba), FTP, NFS, TFTP, AFP, RSYNC, Unison, iSCSI (initiator and target), HAST, CARP, Bridge, UPnP, and BitTorrent. All are highly configurable by using a web interface. Hacking-Lab LiveCD. Hacking-Lab LiveCD is a Xubuntu-based live CD image produced by Hacking-Lab, an IT security portal that deals with hacking and defence strategies. Sahalana Linux. Sahalana Linux is an Ubuntu-based distribution, developed in Sri Lanka, with the goal of facilitating effective use of information and communication technologies by civil society organisations throughout the country.